Panagiotis Plotas is one of my oldest friends who sends amazing recipes from time to time. Today he is tackling octopus. 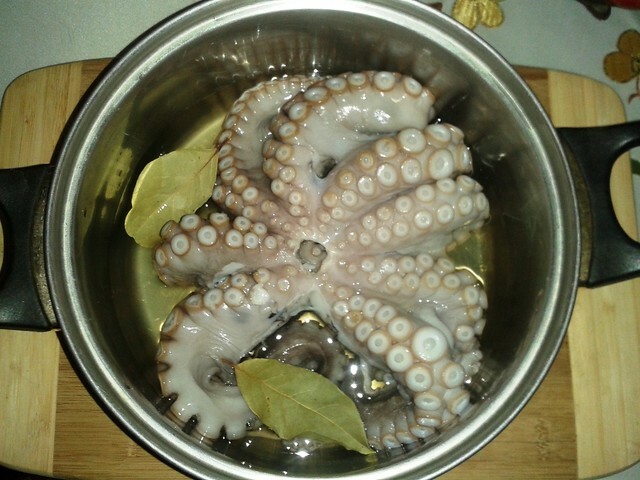 I am well aware that most non Greeks find octopus extremely yucky but – trust me on this – you are wrong! No offence. Just try Panagiotis’ recipe and you’ll see the light! Wash the octopus well and get rid of the nasty stuff (the hard part bang in the middle). Put it in a small pot with 1 cup of white whine and two bay leaves. 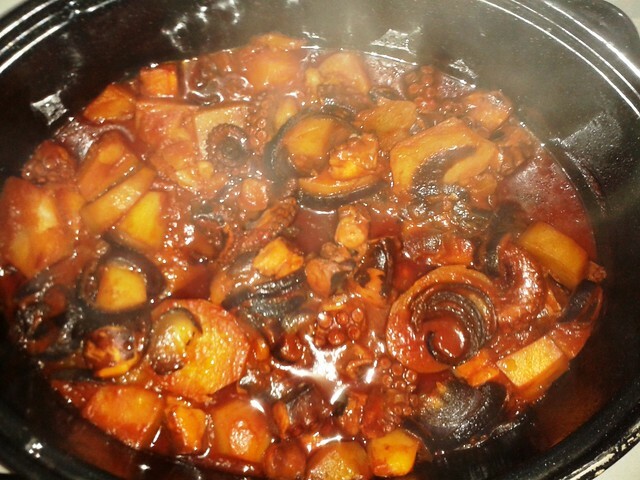 Bring to the boil and let it simmer for 25 to 30 minutes. When it’s ready, take it out of the pot and chop it in big chunks. Get rid of the bay leaves but keep all the juices in the pot. 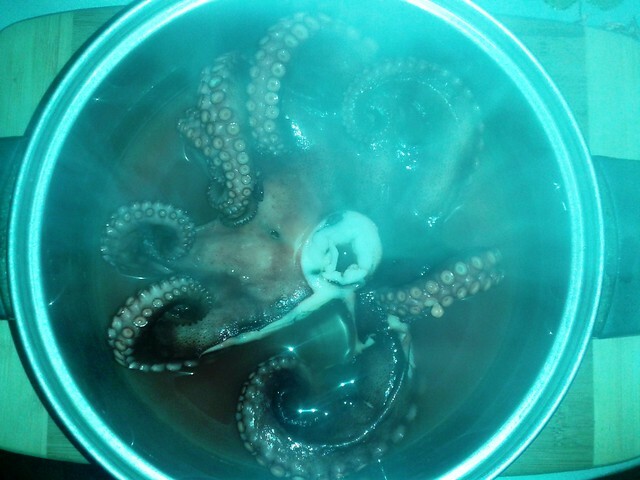 In an oven pot, place the octopus pieces, the olive oil, salt, pepper, your second glass of white white, the juices from the boiled octopus, the tomatoes (chop em finely), the tomato paste, your onions cut in thin strips, potatos cut in chunky pieces and toss em all together so that everything is incorporated. Close your over pot and put in the oven for 1.5 hours on 170 Celsius (fan assisted). Hint: There is a bit of a trick for crunchier potatoes. Drizzle some olive oil over them and put them in the over on their own for about 10 minutes, before you add them to the pot. You can do this on your oven pot lid if it’s nice and steady. This entry was posted in Fish and seafood, Main Courses, TEXT RECIPES and tagged friends' recipes, octopus, oven pot, Panagiotis, potatoes by Friends. Bookmark the permalink. Digital Scullery friends who eat, cook and send us their stuff.